OF TEST otherwise concrete needs large amount of water for mixing which results in bleeding as well as poor workmanship. APPARATUS • Test sieve of non-corrodible metal having 150 mm to 200 mm diam, and 40 mm to 100 mm depth fitted with 90 µm mesh sieve cloth of woven stainless steel or other abrasion resistant non- corrodible wires. 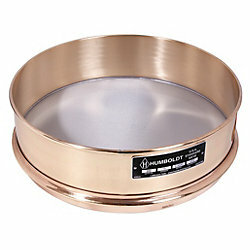 • Suitable tray with lid to fit sieve size. • Weighing balance to weigh upto 10 gms to nearest 10 mg.
• Nylon or pure bristle brush (25 mm / 40 mm bristles) for cleaning sieves. • Agitate the cement sample by shaking for 2 minutes in a stoppered jar to disperse the agglomerates. Wait for few minutes. • Stir the resulting powder gently with dry rod to distribute the fines throughout the sample. • Weigh approx. 10 gm of cement and put in sieve fitted with bottom tray and top lid. • Weigh the residue – retained on sieve. • Clean base of sieve gently by brush to remove fine material. • Find out % (R1) of residue in comparison with total weight of sample. • Repeat the procedure at least twice till results do not differ by more than 1%.